Succulent Scallops drizzled with a divine Pomegranate Sauce. This Seared Scallops with Pomegranate Glaze recipe is the perfect choice for a special occasion. Serve this dish as an elegant appetizer, or even as a light meal. 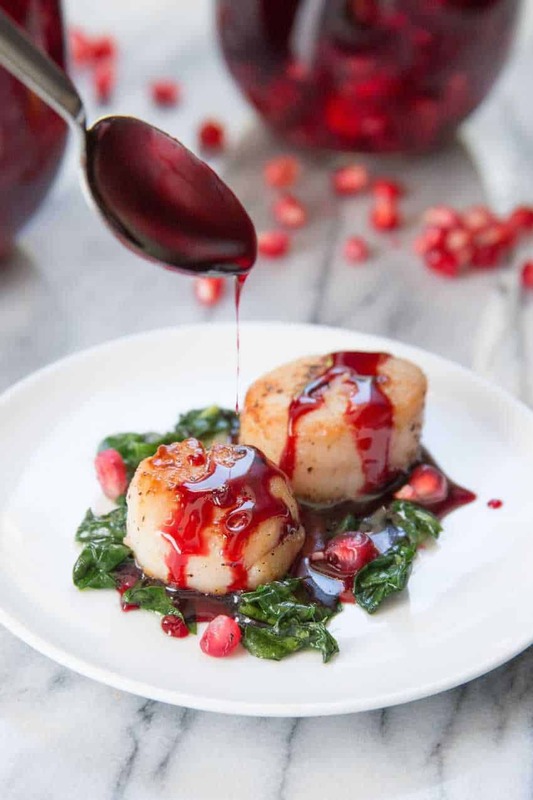 Sweet, juicy scallops are placed a top a bed of lightly wilted spinach and then drizzled with a divine Pomegranate Glaze. The colors are fabulously festive. The green bed of spinach and the gorgeous red hue of the sauce make this recipe particularly popular around the holidays. Even more impressive…this dish comes together in mere minutes. After all, who wants to spend the better part of a party in the kitchen? You’ll be done preparing this Seared Scallops with Pomegranate Glaze recipe before you’ve even finished your first glass of wine. Cheers! Rinse the scallops and pat dry. Heat the oil in a skillet over medium-high heat. Lightly season the scallops with salt and pepper and add them to the pan once the oil is heated. Sear the scallops for two minutes on each side until cooked through and lightly golden brown. Place the scallops on individual plates. Deglaze the pan with 1/4 cup pomegranate juice and a little more oil if needed. Cook the the spinach until it just begins to wilt, and season to taste with salt and pepper. Arrange spinach around scallops. Add remaining pomegranate juice, vinegar and soy sauce to the pan. Once the mixture begin to sizzle, reduce heat to a low simmer and allow to reduce by half, stirring frequently. Drizzle sauce over scallops, garnish with pomegranate arils if desired, and serve. This entry was posted in Appetizers & Snacks, Main Dishes, Recipes and tagged G-Free Foodie, gluten free, kc cornwell, pomegranate glaze, pomegranate sauce, scallops. Bookmark the permalink.